Posted at 10:47 am by Yummytums! I’ve eaten more than my share of hard and sugary granola bars over the years. After all, they’re convenient and portable. Unfortunately, some of them are also sadly lacking in the taste department. So I decided to make my own and see if the results were worth the effort. The truth is that they’re very easy to make. The whole process — from start to finish — takes less than 30 minutes and that includes the baking time. If you’re already into whole foods, you probably have the ingredients in your pantry. And the taste? I can honestly say that there’s no comparison. The homemade bars win by a landslide. Freshness obviously plays a role here. But the fact that you can choose the quality of your ingredients also enters into it. The homemade variety are softer and chewier, both pluses in my book. Give these homemade bars a try. I promise you won’t be disappointed. Brown rice syrup can be found in the natural foods section of your grocery store. I used the Lundberg Family Farm brand. Brown rice syrup is a sweetener produced from brown rice that has been ground and cooked. It’s less sweet than white refined sugar and it still contains some of the nutrients from the whole brown rice. It also has a lower glycemic index than white sugar. I used grade B pure maple syrup, which is often called cooking maple syrup. It also contains antioxidant compounds not found in other sweeteners. While it’s still a sweetener and should be used judiciously, it’s better for you than white refined sugar. For the oats, choose the old-fashioned variety. They’re a whole grain food and are high in fiber. Preheat your oven to 350 degrees. 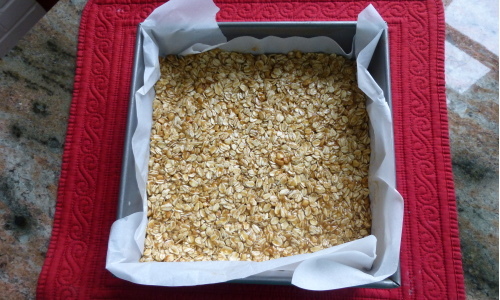 Line an 8″x8″ pan with parchment paper so that the edges of the paper come half-way up the pan. 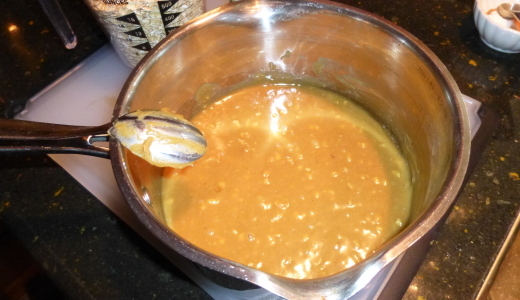 Place the peanut butter, maple syrup and brown rice syrup into a small saucepan and heat over low heat, stirring just until the ingredients are combined. You don’t want the mixture to get hot, just warm enough to combine everything. Remove from the heat and stir in the cinnamon and salt. Add the rolled oats, peanuts and chocolate chips and mix well. Spoon the mixture into the paper-lined pan. Wet your hands (otherwise, the mixture will stick to your hands) and press down firmly, including on the sides. And firmly really does mean firmly! You’ll want them to hold together once they’re cooled. Bake for 18-20 minutes or until the edges begin to brown. Let cool in the pan for 10 minutes, then remove them by grasping the paper and lifting them out. They’ll still be a little warm and I think this is the best time to cut them. Use a large chef’s knife and cut all the way across the center, then into bars. You don’t want to use a sawing motion, just press the knife straight down. The first time I made these bars I didn’t use chopped peanuts and chocolate chips. But the second time I added them and — if you have them in your pantry — use them! They were a great addition.